​Bali ATV Ride and Tanah Lot Tour packages is the entrancing Bali Combination Tour Packages we outlined by provide for both of you distinctive experience of riding ATV bicycle through the beaten track and afterward going to Tanah Lot Temple and other visitor end. Is extraordinary and noteworthy visit packages we offer to make your vacation more amazing in this Bali ATV Ride and Tanah Lot Tour packages. To start the adventure, you will be riding the ATV bike with our expert ATV Ride instructor through the beaten track with length of time 2 hours. after the journey of atv ride finish we will having lunch with Indonesian food, after lunch finish we continue this adventure to visit Taman Ayun Temple is Balinese Hindu sanctuary in Mengwi town, this sanctuary has excellent perspective with big fish lakes encompass the sanctuary and this sanctuary was construct by King of Mengwi town. At that point we proceed the tour to visit our last site in this astonishing Bali ATV ride and Tanah Lot Tour is the Tanah Lot Temple, is Balinese Hindu sanctuary spotted in Tabanan Village with Breathtaking perspective of Indian Ocean, the sanctuary was popular along the tourist and was the most pavorite place to visit in Bali. You will enjoy the adventure with our private car and expert Bali Driver with offer the excellent Bali Tour Service to make your trip more stunning. The following is the description of site we will be visit during the interesting ATV Ride Adventure and Tanah Lot Temple Tours. 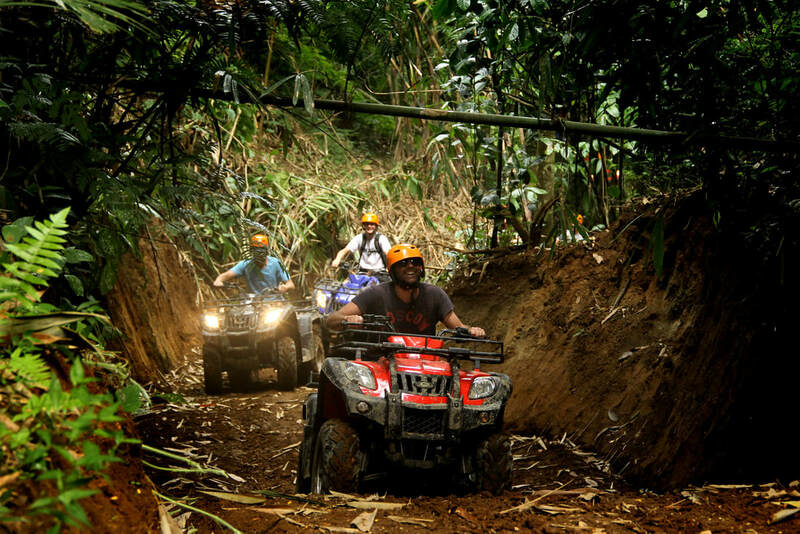 Bali ATV Ride Tour is a part of Bali Adventure Tour Packages we have by allowed you to ride the ATV bike or suggested other than as a Buggy Bike for 2 hours trek to the beaten track and see the dazzling viewpoint in the midst of the excursion. You will incorporation with the viewpoint of rice yard and see the wonderful dependably social activities life in neighboring town. The ATV aide will lead your caper and will offer his best association to make every one of you the all the more satisfying in this atv ride meander. Take picture as much as you like and is free, you can stop at whatever you require amidst this ATV Ride Adventure Tour journey. Taman Ayun actually deciphers as "wonderful arrangement' and is for the most part viewed as a standout amongst the most appealing sanctuaries of Bali. Taman Ayun is arranged in a lovely stop with trees and lakes, close to the town of Mengwi in the south of Bali at around 8 km southwest of Ubud and 18 km northwest of Denpasar. Pura Taman Ayun was inherent 1634 by the Raja of Mengwi, I Gusti Agung Putu. It is a socalled 'Pura Kawiten' or family sanctuary, an exceptional sanctuary where the worshipped predecessors of the Raja Dynasty of Mengwi and imperative lords of different sanctuaries are respected. Tanah Lot Temple is a famous visitor and social symbol for photography and general exoticism. Tanah Lot is asserted to be the work of the sixteenth century Dang Hyang Nirartha. Amid his goes along the south drift he saw the rock-island's wonderful setting and rested there. Some anglers saw him, and purchased him endowments. Nirartha then spent the night on the little island. Later he addresses the anglers and let them know to assemble a holy place on the rock, for he felt it to be a heavenly place to love the Balinese ocean divine beings.